** spoiler alert ** Li really enjoyed the shorter category this was based on, and was a bit distracted figuring out what was added here, but for me this was the first read (although I've read other books by Kelly Hunter and quite like her in general). Enjoyment was actually four stars but I have to deduct one for dropping the ball and making Hallie and Nick come across as callous and indifferent in the case of the bit I put behind the spoiler, because now I feel guilty for having liked the rest so much. 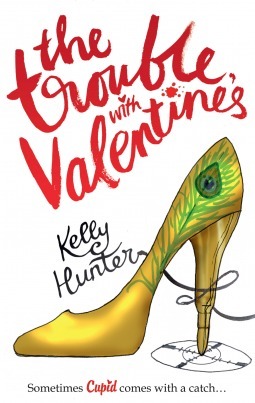 Sign into Goodreads to see if any of your friends have read The Trouble with Valentine's. Wow -- the spoilers really sound out of character for humorous contemporary romance? Or am I not reading enough of them to assume that? It really is out of character, I think so too. She often uses Singapore or Hong Kong as a setting, and she has had background suspense in the books I read, but she is usually much better at not having all out action or dropping a ball like that. I think the editor should have pointed her at that, it doesn't suit the rest of the book and her usual style at all. Umm... well, I agree with all you say! It did seem a bit callous and not in keeping with the mood of the rest of the story. Yes, the Kai/Jasmine storyline was expanded significantly over the original version - good to know it worked for you. Katharine wrote: "These others look cutely fluffy. I'll keep them in mind once I have a job and am buying books again. (After I get Andrea's trilogy!)" I think KH sticks out of the category contemporary romance crowd, much like Marion Lennox. Maybe it's the Australian/NZ factor ^^. I entered, but forgot that you could get the trilogy in one swoop, so asked for the first book.